Hibachi Cooking Grills offer a simple yet great solution for those who love the taste of charcoal grilled foods but don’t have enough space for a full-sized one or would like to take it on road trips. They have become very popular in recent years due to the advantages of using actual fire and their easy-to-carry size; transforming your meals into an experience. So, what is the best Hibachi Cooking Grill? Marsh Allen Hibachi Charcoal Grill: multi-position cooking grids with plenty of space. Update International Cast Iron Hibachi Set: ideal size for pu pu platters and making Asian appetizers. 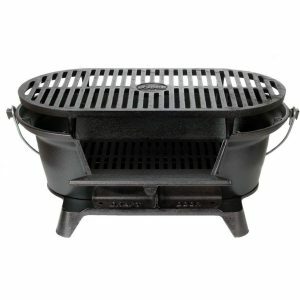 Lodge L410 Pre-Seasoned Sportsman’s Charcoal Grill: height can be adjusted and is easy to clean. Char-Broil Tabletop Gas Grill: portable and with plenty of cooking space. Kole Imports OC864 Hibachi Grill: wooden handles to carry your creations, makes this perfect for decks and patios. In this article, I’ll try to go in depth into all of these wonderful Hibachi grills to give you a general glance at which one best suits your needs or will make diving into Hibachi grilling easier for you. This way, you can either choose one of my top two choices or figure out the best one if your needs differ from mine. First, what is a Hibachi cooking grill? Hibachi grills are believed to have existed since somewhere around 794 and 1185 AD, during the Heian period. The term hibachi literally means “fire bowl”, this is due to the grill’s cylinder shape, with an open top for the grill. Original hibachi containers are created from ceramic or wood and lined with metal. Thus, most of these grills are decorative, and can even be built into furniture to make them easier to use. Nowadays, the ones used in restaurants tend to use electricity instead of charcoal, but the chefs that still prefer actual fire can offer performances and entertain while they cook by creating flames that shoot through the food or around it. It’s quite the view! Don’t confuse them with Teppanyaki grills, though. Teppanyaki grills have an iron griddle with a flat, solid surface that makes it easy to prepare finely chopped sides or meals. Hibachi grills are made from cast iron and have an open-grate design. In order to better understand the pros and cons we will outline below, it’s important to highlight that these grills can come in different shapes, configurations and sizes. Some have a cheaper build made of aluminum but this can cause problems since they have a tendency to rust and end up falling apart. To make sure you get a good hibachi, spend a little more and get a cast iron grill. Some of them have racks with adjustable height. This allows you to have more versatility in regards to grilling, which allows you to adjust the distance between the food and the heat. However, many of the grills with adjustable racks are poorly made and if you plan to take your hibachi with you, you will need a study one. Some hibachi models have bottom or side vents to help you adjust your fire. On the other hand, the hibachi design gets plenty of air to keep the fire going. Although, the vents will allow air to increase the heat of the fire by rising through the grill. Next, I will continue to dive into the hibachi grills that we mentioned above, highlighting the features that make these the best in the market and worth every dime. This is the grill that better resembles an original Hibachi grill, so if you feel like experiencing both the cooking and the culture at its finest, this is the one for you. It’s made from cast iron and is the perfect size to fit in the center of a pu pu platter. I saw the best price for it here on Amazon. Visually, it’s a marvel due to the dark cast iron body featuring an appealing dark wood base. It’s also available as a dragon set with an antique brass finish. This set includes both the grill and fuel holder, and can be used to cook a variety of appetizers. On the other hand, we also need to point out that some have said that food tends to stick on the surface or that the top rusts easily. We haven’t had any problems in this sense, but it is good to consider the possibility. Others have complained that the cooking surface is very small. This makes it perfect for personal use or travelling but can be an issue for people cooking large amounts of food. Featuring adjustable cooking grids that can be positioned anywhere, this grill helps you perfectly cook your meals. It also has more than 150 sq in of cooking space which means there’s plenty of room. The wooden handles are a nice addition since they make it easier to adjust the grill plate and keeps you safe while doing so. It also features two adjustable air vents which assist in controlling the rate at which the charcoal burns. Bonus: the upward curved sides on the grid keep the food in place. However, you should also know that assembling this grill can be tricky to some people since it’s heavy and some of the components seem a bit cheap. The best feature on this grill is probably the adjustable height, which sports two options. This will prove especially useful if you fear the thought of having to clean up your grill by hand. The cooking grates are also seasoned already which means they’re ready to use. It also features a draft door that lets you regulate the heat, which makes cooking your desired meals way easier. Also, the coals are easily accessible through a flip-down door on the back of the grill (you can take a look at it here on amazon). On the downside, you need to flip the grill over in order to adjust the height, the cast iron might take a while to heat up and this grill requires routine maintenance to keep it pristine shape. This Hibachi grill is the perfect size for celebrations on decks and patios. It has a very strong metal construction and adjustable cooking grates which provide you full control over your meals. It also features an adjustable air vent which gives you control over the burn rate. Additionally, the wooden handles make it very easy to transport. On the downside, some people have reported the handles feel flimsy, there is a relatively small cooking surface and it’s designed for outdoor use only. You can take a look at these additional reviews on Amazon to see what other customers are saying. If your priority or immediate use for your Hibachi grill is portability, then you should definitely consider this one, and it isn’t that expensive here. It is designed for grilling just about anywhere since it features heat-resistant handles and even has legs that fold over the top of the grill to lock the lid in place. It also features more than 180 sq in of cooking space. What does that mean? It means you can cook about 9 hamburgers at the same time and still leave enough space between them. It’s worth mentioning this grill is made of high-quality steel material which guarantees this grill will last you for multiple grilling sessions and we believe it might even be able to avoid rust. However, being such a powerful grill, assembly can be time-consuming and some of the components have sharp edges. Also, it can be a bit awkward to light the fire on the grill. Now you may have noticed that the grills mentioned above all use charcoal. This is because charcoal-fired hibachis give you many more options than electrical ones. However, you still need to remember that they don’t have a lid, unlike many other similar grills. Most hibachis have enough space to allow you to control your fire on separate temperatures (two-level fire). This means you can control the number of coals on either side so one side is hotter than the other. This is particularly useful to grill your items on one side and keep them warm on the other one. The possibilities are endless. 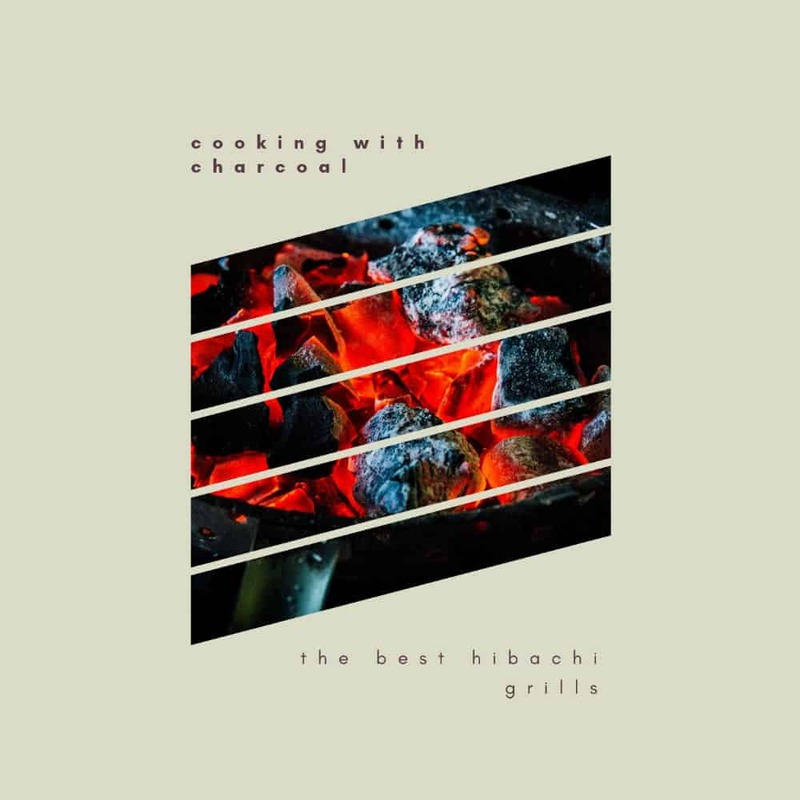 Like any other cooking appliance you need to analyze your particular needs and preferences so your new item makes you enjoy the new things you will try, like hibachi grilling. Always remember to stay safe when using a hibachi grill by keeping on a sturdy surface clear of nearby dangers. A small and portable hibachi is a great grill for camping trips and similar events. Experiment, find out what works better for you, and enjoy concocting fantastic meals in your new hibachi grill.